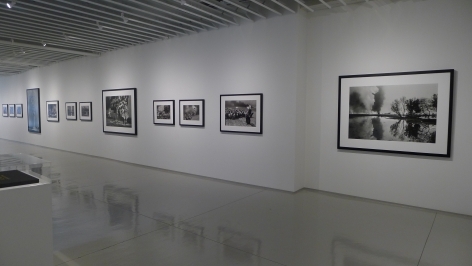 For his second solo exhibition at Sundaram Tagore Chelsea, world-renowned photographer Sebastião Salgado presents a selection of stunning monochromatic photographs from his landmark series Kuwait. 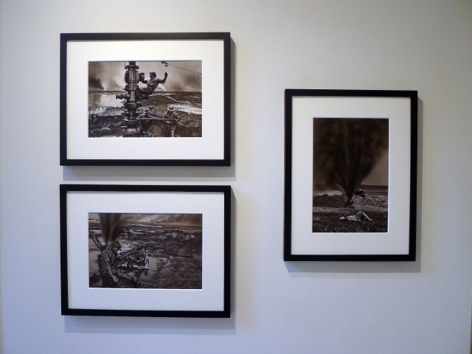 The artist will be in the gallery for the exhibition opening Thursday, March 30. 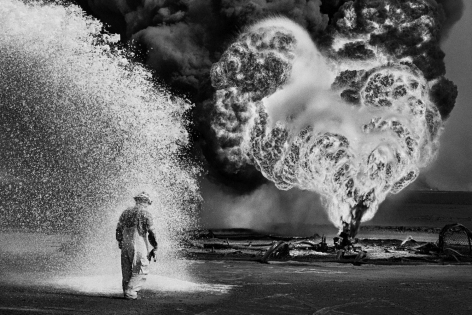 Shot in 1991 as the Gulf War drew to a close, the images in this show chronicle the raging oil well fires ignited by Saddam Hussein’s forces as they retreated from Kuwait. 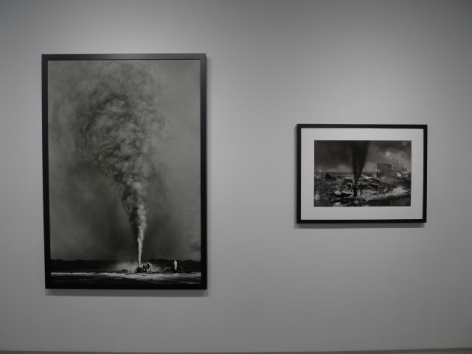 This exhibition of stunning photographs, curated by Lélia Wanick Salgado, lays bare the devastating environmental consequences of war. 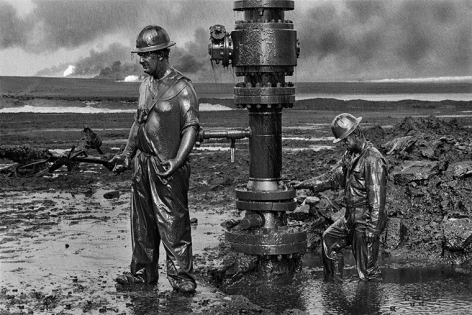 Considered one of the worst man-made environmental disasters in history, this event began when Saddam Hussein, recognizing the war was over, ordered his retreating military forces to ignite some 700 oil wells and a number of oil-filled low-lying areas in an attempt to destroy the region’s most sought-after natural resource. It took nearly eight months and the Herculean efforts of firefighters from around the world to contain the towering infernos. 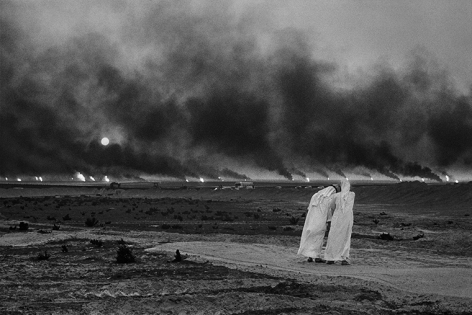 As their efforts progressed, Sebastião Salgado, on assignment from The New York Times Magazine, traveled to Kuwait to document the disaster firsthand. 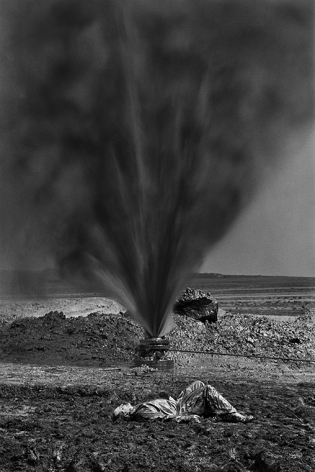 Upon his arrival, Salgado encountered unbelievably brutal conditions—billowing flames and suffocating black clouds releasing tons of carbon dioxide into the atmosphere and heat so fierce it warped the photographer’s smallest camera lens. The circumstances were so perilous that a journalist and another photographer covering the story were both killed when an oil slick they were crossing ignited. 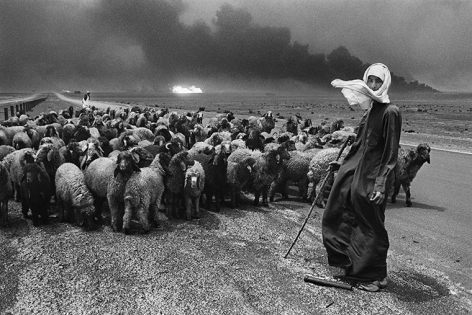 Staying in close proximity to the firefighters, Salgado endured the intense heat, smoke and toxic fumes to document the workers’ unyielding efforts to extinguish the fires as they ravaged the landscape, leaving a horrific trail of soot, blackened sand and the charred remains of camels. 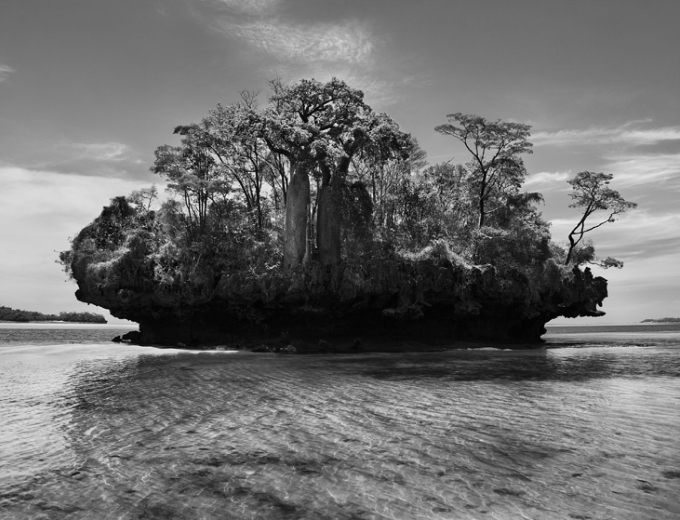 This epic series first appeared in The New York Times Magazine in 1991 and has since been hailed as one of Salgado’s most compelling—and courageous—bodies of work. 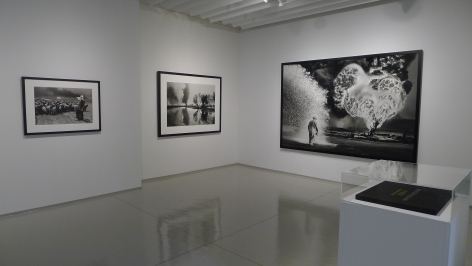 It earned him the prestigious Oskar Barnack Award, which recognizes outstanding photography on the relationship between man and the environment. 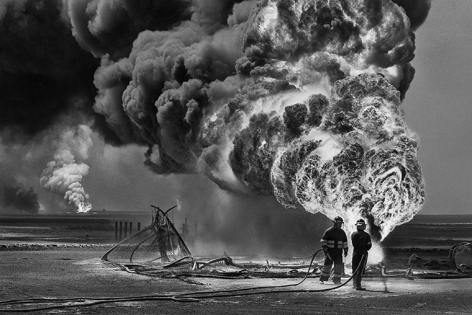 The images from this show are the subject of a recently released book titled Kuwait: A Desert on Fire (Taschen, 2016), the first published monograph of this series. 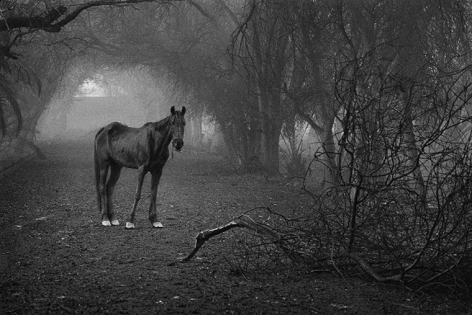 Edited by Lélia Wanick Salgado, the book is also available in a limited collector’s edition signed by the artist. In conjunction with this exhibition, work from Genesis (2004 – 2011) and other iconic series will be on view at Sundaram Tagore Madison Ave., opening April 1, with a book-signing with the artist from 6 to 8 pm. Sebastião Salgado was born in 1944 in Brazil. He lives in Paris, France. Having studied economics, Salgado began his career as a professional photographer in 1973 in Paris, working with several photo agencies including Magnum Photos until 1994, when he and Lélia Wanick Salgado formed Amazonas Images, created exclusively for his work. 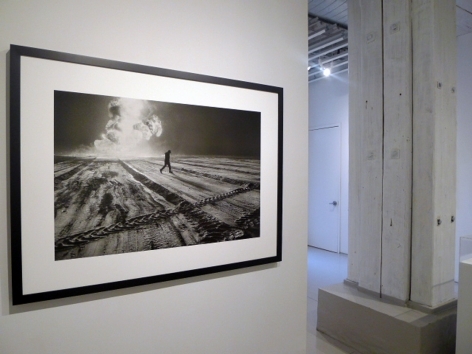 Salgado has traveled to more than 100 countries for his photographic projects. Beyond press publications, his work has been presented in books such as Other Americas (1986), Sahel: l’homme en détresse (1986), Sahel: el fin del camino (1988), Workers (1993), Terra (1997), Migrations and Portraits (2000), Africa (2007), Genesis (2013) and The Scent of a Dream (2015). Touring exhibitions of this work have been, and continue to be, presented throughout the world. In 2013 the book De ma terre à la Terre (From my land to the planet), a narrative account of Salgado’s life and career, was published, and in 2014, the documentary film The Salt of the Earth, directed by Wim Wenders and Juliano Ribeiro Salgado, was released. 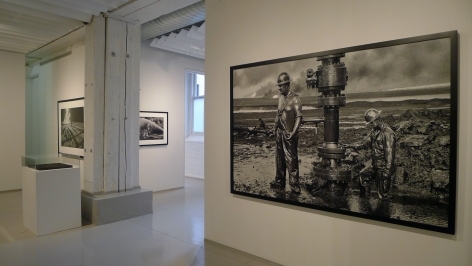 This exhibition follows the success of Sebastião Salgado: The World Through His Eyes, which was recently on view at the Bangkok Art and Culture Centre. 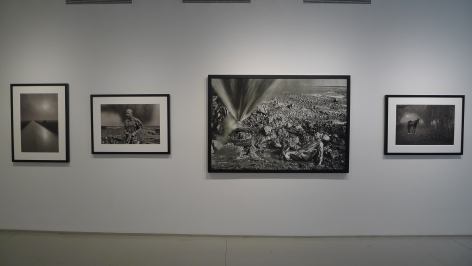 The show, his first major presentation in Thailand, is produced in partnership with BACC, The Royal Photographic Society of Thailand and Sundaram Tagore Gallery. 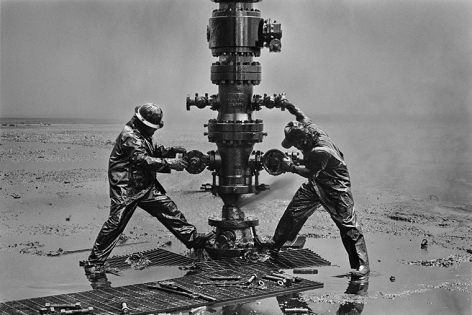 Sebastião Salgado has been awarded numerous major photographic prizes in recognition of his accomplishments. He is a UNICEF Goodwill Ambassador, and among other distinctions, an honorary member of the American Academy of Arts and Sciences. 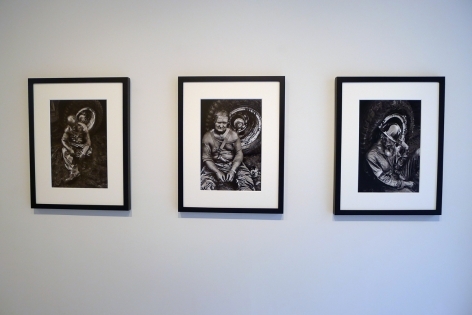 In April 2016, Salgado was elected member of the Académie des Beaux-Arts of the Institut de France, for the seat previously occupied by Lucien Clergue. In July 2016, he was named Chevalier (Knight) de la Légion d’Honneur, France. Together, Lélia and Sebastião have worked since the 1990s on the restoration of a small part of the Atlantic Forest in the state of Minas Gerais in Brazil. In 1998 they succeeded in turning this land into a nature reserve and created the Instituto Terra. The Instituto is dedicated to a mission of reforestation, conservation and environmental education.